The church at Carleton Rode is part of the Pilgrim Benefice, Long Stratton & Wacton Parishes. The group is made up of eight churches from the surrounding parishes of Aslacton, Bunwell, Great Moulton, Tibenham, Wacton and Long Stratton. At Carleton Rode All Saints we have an active and lively congregation. Full details of our services can be found on the church’s own website www.carletonrodeallsaints.co.uk or in the monthly parish magazine. You can pick up a copy of the parish magazine from the church. Another useful source of information about our church is 'A Church Near You' on http://www.achurchnearyou.com/. The summer months are packed with events organised by members of the church congregation. The most notable and widely supported is the annual fete which usually takes place during late June/early July at the Village Hall playing field. There is bowling for a pig, tombola, book and cake stalls, plant sales and numerous ‘have a go’ competitions as well as a main attraction. The organising committee is always looking for new members to take part both on the day and to organise stalls and events. If you would like to get involved please call Reg Love (Chairman of the organising committee) on 01953 789310. We also actively encourage trade and craft stands so please call or email us if you are interested in participating in this event. Local mum and now grandma, Carole Francis, first set up Choruses with Mum – a Christian Group for mums and toddlers – 27 years ago and in that time the club has seen over 300 children taking part. The children and toddlers (as well as mums, dads and grandparents) enjoy activities including Christian children’s songs, playing musical instruments and getting a bit messy with many craft activities, weekly Bible stories and the children’s own prayers. There is also a Christian library with books and videos to borrow (all free of charge). Children from as young as a few days to school age are welcome. The afternoon includes tea/coffee for adults and squash for the children and is free to all. The group (including dads and granddads and grandmas) meet at Harefield, 55 Bunwell Street, Bunwell on Mondays in term time from 1.30-3 p.m. For more details contact Carole Francis on 01953 789595. Although Carleton Rode doesn’t have a Messy Church we are closely linked with the Long Stratton Benefice which holds Messy Church every third Saturday of the month at St Mary’s Junior School in Long Stratton. Messy Church at St Mary’s Junior School is really well attended with over 20 families regularly attending. The morning starts with breakfast at 9 a.m. followed by crafts and activities at 9.30 a.m. and finally a short 15-minute worship service aimed at the young at 10.45 a.m. This event is free but donations are always welcome. 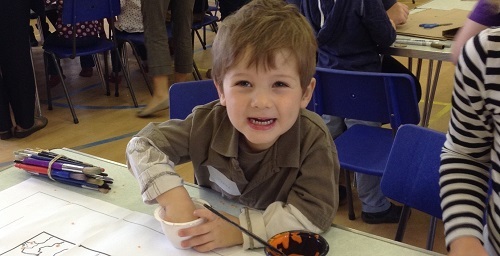 For more information contact Joan on 01953 860291 (evenings only) – more details on Messy Church can be found at www.messychurch.org.uk. We also have an active group of bell ringers who generally practise on the six restored bells at All Saints' Church in Carleton Rode. Reg Love, a local bell ringer, said 'it’s a great way to keep fit and preserve our heritage as well as getting to know the local community. We meet on a Wednesday evening from 7.30 until 9 p.m. and would love to see more people have go'. If you are interested call Reg on 01953 789310. ‘HOPE’ was a nationwide initiative started in 2008. A few years ago the name was changed to HOPE TOGETHER, which we agreed to continue in our area. The original idea was to have all denominations join together in an effort to get the Good News of Jesus to as many people as possible. Locally, it involves the Anglican churches in our Benefice, Carleton Rode Baptist Church, Great Moulton Chapel and the Faith Mission, creating a real unity. We have as our motto, 'Christians working together in five villages to show God's love in word and deed'. With this in mind we have a 'Cafe Church' on the third Sunday of each month. This is held in either the Jubilee Hall in Carleton Rode or in Bunwell Village Hall. We meet regularly to plan events at various times throughout the year. Always popular is the ‘Big Breakfast’, held on the Saturday between Good Friday and Easter Sunday. Our events are usually free of charge, except for the very successful and enjoyable Barn Dance, held in Tibenham Community Hall. It is uplifting to see everyone, regardless of their church or denomination, (and also those with no particular allegiance), working together and enjoying the experience. More information can be found by contacting Peter Francis, Chair of the HOPE Together Team (01953 789595). The feast of All Saints is of ancient origin and can be traced to the foundation by Pope Gregory III (731–741) of an oratory in St Peter's, Rome, for the relics ‘of the holy apostles and of all saints, martyrs and confessors, of all the just made perfect who are at rest throughout the world’, with the day of remembrance established on 1 November. This fell on the Celtic holiday of Samhain, which was also a harvest festival. A November festival of all the saints was already widely celebrated on 1 November in the days of Charlemagne. It was made a day of obligation throughout the Frankish empire in 835, by a decree of Louis the Pious, issued 'at the instance of Pope Gregory IV and with the assent of all the bishops', which confirmed its celebration on 1 November. The festival was retained after the Reformation in the calendar of the Anglican Church. The chancel of All Saints' in Carleton Rode dates from the twelfth century and was consecrated around 1307 but construction took a further 200 years to complete. The nineteenth-century reconstruction of the top of the tower makes it appear as if a huge church has been built against a small tower. In fact, the top collapsed in the eighteenth century, and it is a truncated form of the original tower that you see today. This church was built, in it God to adore, and ought to have been repaired long before. For if decays they early don't prevent, they will, like us, when 'tis too late, repent. When the nave was rebuilt in the late fifteenth century the building was already an aisled church. The east windows of the two aisles are older than the nave, and the east end of the new arcades falls short of the wide chancel arch, leaving an earlier arch on the south side which is little more than a large doorway. All Saints' Church is notable for the dado of the roodscreen, depicting the eleven disciples and St Paul. A recent addition is the upper element of the roodscreen, made by a local craftsman. In the north aisle, a memorial recalls two Norfolk tragedies of the Second World War. Twenty-eight American servicemen lost their lives in two separate mid-air collisions over Carleton Rode in 1944 and 1945.